In 1987 the Italian firm Cagiva purchased the motorcycle division of the Swedish Husqvarna (which also built guns and chainsaws) but a few rogue engineers decided to break out and start their own thing. From 1988 through 1995 (when it was acquired by KTM) a small company called Husaberg built enduro racing bikes without the huge backing of a conglomerate with a surprising amount of success. 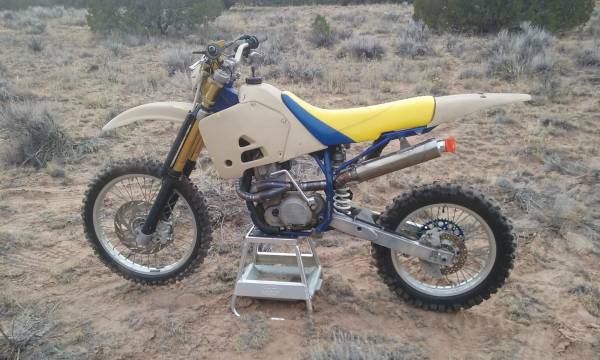 Find this 1998 Husaberg Fe501 offered $2,000 in Albuquerque, NM via craigslist. Tip from Johnny B. This is not your average Husaberg, because it was run by Jimmy Lamastus in the 1998 world championships and apparently won the Denver round. 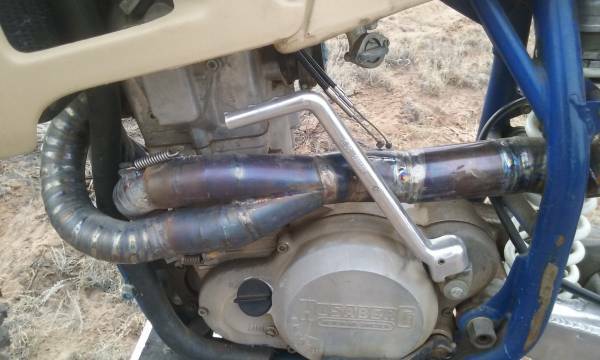 It has all sorts of custom one-off race parts, including a set of Husaberg forks that cost $10k when new and a full titanium exhaust. It is far from perfect and has been in storage since 2001, but once you patch the hole in the muffler and do some fine tuning, this thing could be a fun bike with an interesting history. I used to have a 1995 FE350. It had something very bad happen internally, but I never broke the engine down to find out what. Engine only turned 1/3 of a revolution. Would roll in neutral or with the clutch in, so not the trans. I had a factory service manual....but I don't read Swedish. Parts are extremely hard to come by. For a time, I considered robing it of it's suspension parts or maybe making a special with another brand engine. The chain is on the wrong side for most engines (only a few KTMs would work...). 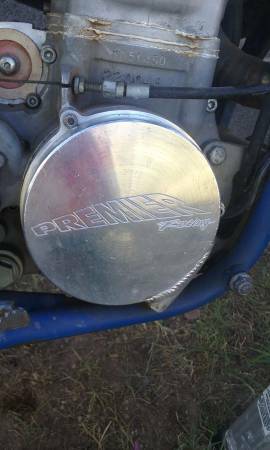 The air box was in the middle of the gas tank. A buddy with an extra alcohol kart engine tried to convince me to put that in there, at least the chain was on the same side. Fortunately the bike, the engine, a welder, and a lack of sobriety were never in the same place at the same time. I hauled it to a vintage bike swap meet with a bunch of other stuff a few years ago. One of the other vendors came by my spot about every hour to see if I still had it. He was selling vintage magazines and memorabilia at a few bucks a pop. About the time I was packing up to leave, he came back one more time and I finally took his then best offer rather than put it back on the trailer. $97 cash (mostly ones and fives) and two cold cans of Budweiser (it was 90-95 out). He had 2 or 3 other basket case Husabergs and planed to break mine for parts, eventually he may get one running I guess. Now that I think about it, I think the bike I had was a 1992. Hardly makes a difference. I wonder how long before a running one of these is worth a pile of money. I guess not yet is the answer. Used to race one in a SuperMoto series here in the UK. Super light bike and engine that revved to the moon (and back). Biggest downside to the Bergs was the LH side kickstart!!! Hey im still selling this FE501... Im amazed its not sold yet. Im temped to finish what i started and build it into an enduro since is has some history. Its still listed on the Phoenix Craigs list.